When the New York International Auto Show opens next week, Honda will unveil details and features for the refreshed 2014 Odyssey minivan, the nation's best-selling family people mover. The current 2013 Honda Odyssey is an award-winning van with an Insurance Institute for Highway Safety (IIHS) Top Safety Pick rating, an AutoPacific Ideal Vehicle award, an ALG Residual Value award winner, and a multiple choice for Best Family Cars of 2012 from Parents Magazine and partners Edmunds.com and Kelley Blue Book. So it's no wonder the Odyssey is a best seller. 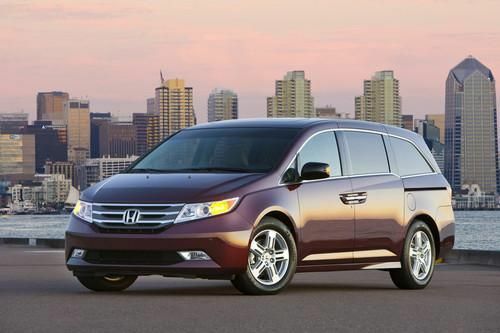 The new 2014 Honda Odyssey will feature technology upgrades and safety additions when it debuts in New York. Honda promises some segment exclusives and options to further solidify the van's position as strongest overall ownership value in the segment. Alongside the 2014 Odyssey will be other new Honda offerings, including the 2014 Accord Plug-in Hybrid and 2013 Fit EV, both of which have recently launched in New York dealerships. The Accord Plug-in has an EPA rating of 115 MPGe in electric-only mode and is the first production car to meet the Environmental Protection Agency's LEV3/SULEV20 emissions standards. The five-passenger 2013 Honda Fit EV is an all-electric car with an unusual fully-independent multi-link rear suspension and achieves an EPA combined 82 miles of range. Press events for the New York International Auto Show (NYIAS) begin on March 27 and the show opens to the public the evening of March 29 in a special sneak preview and officially on Saturday morning.